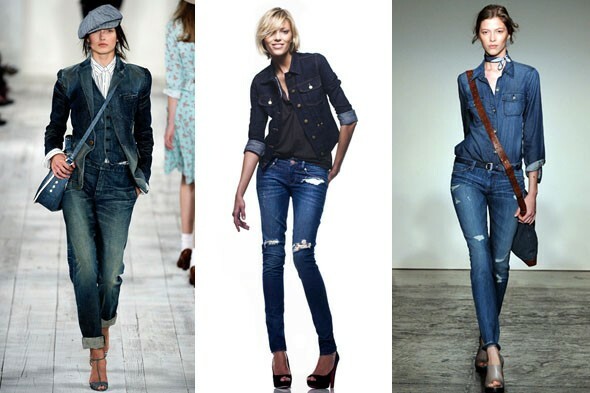 Denim on denim was a fashion faux-pas for a very long time, however last year the trend became fashionable and many celebrities as well as fashionistas around the world started sporting this look. Don’t have a denim shirt? Just grab on a nice denim jacket and pair it up with your fav dark blue jeans or shorts, just like Rihanna. Break up the monotony with a belt of your choice, accessorize with a leather sling bag or tote and comfy sandals or heels, and you’re good to go! Rihanna wearing a light blue denim jacket on white denim shorts. Ashley Olsen in a light blue denim shirt and black denim skinnys. Different ways to sport this trendy look.